An international field of scholars from art history, anthropology, history and literature, as well as curators and writers, explore the impact and legacy of Australia’s most revered art historian. Bernard Smith could rightly be called the founder of Australian art history. His influence on Australian cultural life was immense, from the publication of Place, Taste and Tradition in 1945 until his death in September 2011. Each of his publications nurtured an Antipodean view, whether art historical or anthropological, and opened up new fields in Australian scholarship.The Legacies of Bernard Smith arises from a collaborative international conference convened in 2012 between the Universities of Melbourne and Sydney, and the AGNSW. 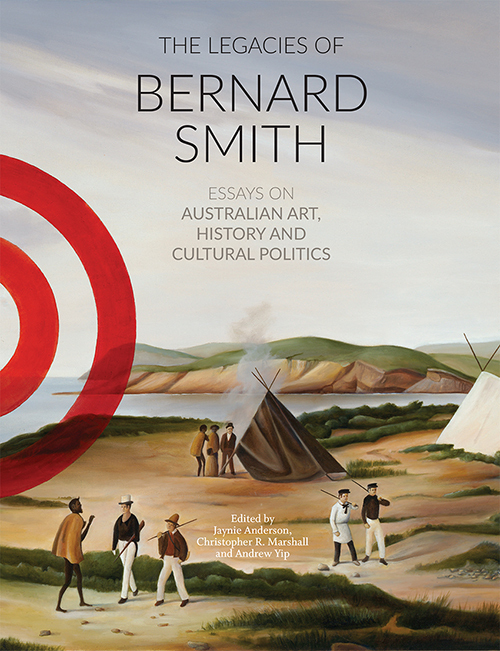 It is the most significant work on Smith’s impact to date, with over twenty contributing authors, and examines his legacies in Australian art history, museology, Pacific art studies, Australian studies and Indigenous art. Contributions from: Jaynie Anderson; Andrew Sayers; Robert W. Gaston; Nicholas Thomas; Rüdiger Joppien; Kathleen Davidson; Terry Smith; Peter Beilharz; Catherine Speck; Paul Giles; Simon Pierse; John Clark; Steven Miller; Joanna Mendelssohn; Christopher R. Marshall; Jim Berryman; Ann Stephen; Max Solling; Kate Challis; Sheridan Palmer; Catherine De Lorenzo; Ian McLean. Jaynie Anderson was foundation director of the Australian Institute of Art History at the University of Melbourne (2009–2015) and Herald Chair of Fine Arts (1997–2014). She is a fellow of the Australian Academy of the Humanities and immediate past president of the International Committee of Art History. In 2015 she received, from the President of the Republic of Italy, the knighthood of Ufficiale dell’Ordine della Stella d’Italia. Educated at the University of Melbourne, Bryn Mawr College and the University of Oxford, she has curated exhibitions in Australia, Europe and the United States, and published widely, particularly on Italian art of the Renaissance. Christopher R. Marshall is senior lecturer in art history and museum studies at the University of Melbourne. His publications on museums and curatorship include Sculpture and the Museum (2011) and contributions to Museum Making, Making Art History and Reshaping Museum Space (2005, 2007 and 2012). His publications on Neopolitan Baroque art include Baroque Naples and the Industry of Panting (2016) and a chapter contribution to The Economic Lives of Seventeenth-Century Italian Painters (2010). He has held fellowships from the Australian Research Council; the National Gallery of Art, Washington DC; the Henry Moore Institute; Museo Poldi Pezzoli; Hubei Institute; and Duke University. Andrew Yip is an art historian, producer and researcher, whose interests range from the politics of Australian artists at war to digital approaches to preserving intangible cultural heritage. In 2006 he was a visiting researcher at Bosphorus University, Instanbul, and is currently a postdoctoral research fellow at the Laboratory for Innovation in Galleries, Libraries, Archives and Museums, University of New South Wales. He has worked at the Art Gallery of New South Wales since 2010 on numerous exhibitions and programs, including co-curating the gallery’s World War I commemoration program and managing tertiary education. The Legacies of Bernard Smith is available from Power Publications online and in all good bookshops.